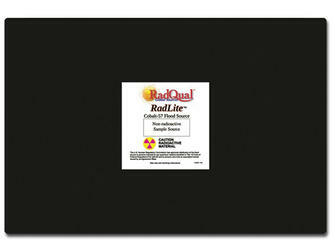 The RadLite™ Cobalt-57 Flood Source features a new, slimmer design and weighs 60% less than previous models. Cobalt-57 flood sources are used to test the response uniformity of gamma cameras to ensure camera response is consistent over the total head area(s). Cobalt-57 is uniformly dispersed in an epoxy matrix fully sealed in a high integrity ABS encapsulation. Radionuclide purity is greater than 99.9% (combined Co-56/Co-58 is less than 0.08% at source reference date). RadLite™ flood sources are supplied with a uniformity test statement, wipe test certificate, handling and storage information and a custom decay calendar. Cobalt-57 Flood Sources are manufactured and 100% tested to have a coefficient variation of less than ±1.0% and integral non-uniformity of less than ±2.5%. SPECT imaging procedures require less than ±1%coefficient of variation. FREE disposal when you purchase a NEW reference source from Biodex (applies to United States only).